For centuries, Pelican Shoal located 6 miles offshore of Boca Chica, was an important nesting area for the roseate and bridled terns. The quarter acre island comprised of coral was high enough that the nests stayed safe. The birds were surrounded by an abundance of food, and due to the further out location, the human traffic was minimal so the nests weren't disturbed. However that all changed during the bad hurricane seasons of 2004 and 2005. This tiny island that had been an important part of these bird's life cycle was severely decimated. All that was left was a pile of rubble. Since then, there's been no sign of these birds returning to nest amongst the island's remains. 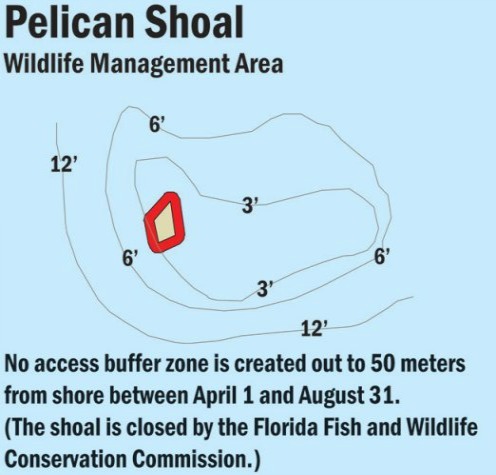 Due to the importance of this 'island', especially for the nesting habits of the roseate tern, the area has now been designated a critical Wildlife Management Area by the Florida Keys National Marine Sanctuary. This coral reef itself is a less developed spur and groove formation than what you would typically see in the area. In particular it lacks much of the development that is so obvious at the more heavily trafficked Looe Key Reef. This site is also too far east for most dive centers from Key West FL to travel. Divers interested in a day trip here will have better luck contacting a Florida Keys dive centers located in Cudjoe Key or Summerland Key. This is one of Florida Keys dive sites that's located further out. However that's proves to be one of it's advantages. Less traffic usually means more fish, and other marine life. This area has plenty of both and with it's easy depths, it a great Florida Keys dive spot for most divers and anyone interested in Florida Keys snorkeling.